My journey, from quiltmaking to writing novels about quilters, started at the library. I’ve always been a voracious reader, so it was a natural place for me to learn about quilting. Twenty-five years ago, I checked out a book on quilt making. There were few quilting books being printed back then, and only one or two in my library. The big innovation in this book was the idea of chain piecing, just pushing one set of blocks under the presser foot without cutting the thread. What a timesaver! The instructions were for a rail fence quilt that was cut out by hand, using a pen to mark off rectangles and scissors to cut them out. My bloodstains can still be seen where I nicked myself as I worked. A twin size quilt took me three nights to cut out. Is it any wonder I didn’t quilt again for five years? Here’s a picture of that quilt. I was so proud of it. Have mercy. Fabric choices were limited back then. When I got laid off from my job (anyone remember the eighties recession? ), I took my first quilt class. Despite that it was hand piecing and the teacher disapproved of more than three fabrics in a quilt, I was hooked. I must hold the record for checking out the library’s copy of "Quilts, Quilts, Quilts" by McClun and Nownes. I was so thrilled when the family budget eased so I could buy my very own copy. At the same time, I began writing fiction. I wrote a romance that was rejected by three publishers. That experience taught me that my real love was mysteries and that I wanted to read about people like me and the people I knew, who were quilters. On another trip to the library I met Laurie R. King, a successful novelist. Hearing her talk forced me to get serious. I began taking writing classes, and stated my intention before my classmates to write a mystery demonstrating that quilters were as venal and murderous as the rest of the population. When that got a laugh, I knew I was on to something. I began work on WILD GOOSE CHASE, my first quilting mystery. I was working in a quilt shop at the time, teaching rotary cutting, so the weapon was a no-brainer. When I saw the cover with the bloody rotary cutter with my name inscribed on the handle, I was thrilled. It was like making that first quilt all over again. I’ve made dozens and dozens of quilts since that first one. 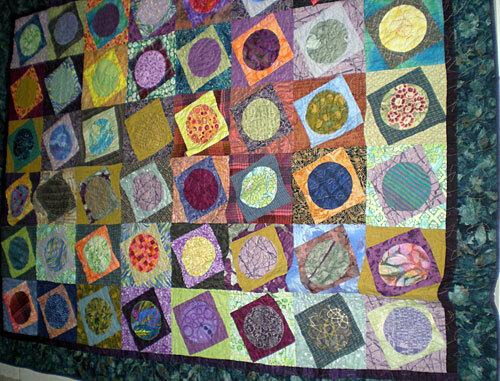 The blocks in this one pictured here accompanied me to writing conferences where I hand sewed the circles. It was a conversation starter. I’ve written five books, three quilting mysteries and two rubber stamping mysteries. WILD GOOSE CHASE, OLD MAID’S PUZZLE, and STAMPED OUT were released in 2008. OCEAN WAVES and INKED UP will be out this year. Quilting has brought me my closest friends and allowed to me to fulfill my greatest ambition, to write a mystery novel. It all started at the library. How about you? Are you a library user? Better yet, a librarian? Have you ever set foot in a library? Leave your comment about libraries, books or quilts and you’ll be entered to win an autographed copy of WILD GOOSE CHASE, the first Quilting Mystery in the series. The lucky winner will be chosen on Friday, February 27, 2009. When I was in second grade, the elementary school library was in the back of our classroom. I don’t remember much about classwork that year as I would select a book, read it from cover to cover, get out of my seat to replace it and select another one. The teacher didn’t seem to mind but then I was quieter and in my seat most of the day. Then when I was ten I got to visit the public library. I determined that some day I would read ALL of the books there but I didn’t want to be a librarian–too many people interupting a good book read with questions plus borrowing the books I wanted to read. I am an avid library user. I live right up the hill from the library and usually stop in at least three to four times a week. The library ladies have said we should rig up a basket and pulley setup so I can just save myself a walk. The biggest decision in my life is fortunately to sew or read! When I was younger, I used the library regularly. I read almost every science fiction/fantasy fiction book our small town’s library stocked. I am just discovering quilting and the quilting mysteries. They are great! I would love to check novels from the library, but I can’t because I wouldn’t be able to stop thinking about where that book may have been. I also understand that library books can have bedbugs in them. My first job was as a page at the library. I had to re-shelve all the books that were checked in or left on tables, etc. I loved exploring the shelves as I worked and discovered books that I hoped to someday read. I must admit that I don’t get to the public library as much anymore, but I work at a school and love to visit the library there. I am happy to say that my daughter has inherited my love of books and reading. She checks out many books – often starting a new novel before she’s finished the last one. I look forward to reading more of your work. I have my nose buried in at least 3 book right now. AND quilting is my way of keeping sane! I so enjoy seeing the difference color makes when put them together. Keep up the good work. Libraries have always been a part of my life. I remember the first book I ever signed out all by myself, and I walked there by myself too….that’s when a 5 year old could walk the streets alone and unharmed. That book was all about bunnies, pink and blue and colored…I shared that book with my best friend and took her on my next outing and helped her select a book. I LOVE libraries! I never moved away and still go to the same library more than 40 years later…. I also volunteered at our elementary school library for a year or two…I just love organizing books! Learned to repair and cover them too. Wow, I knew quilters and office supply stores were a match, but I didn’t realize how many of us were library nuts, too! I’m so glad. Feels right at home. Sylvia, Mary, Sandy, Debbie, Shelley, Aida, I love all your stories about the library. The library is the first place I go in a new town, and I remember that feeling as a kid when I wanted to read every book in the building. I’m glad the younger generation is feeling like that too. Lots of quilters, including me, use books on tape so we don’t have to choose between writing and quilting. Someday I may have to move close enough to one to install the pulley system. I like that idea. At a new elementary school in 3rd grade, the librarian was quite distressed that I wanted to check out books from the “6th grade shelves”. Now, I don’t frequent the library so much…but I’m usually reading 2 books at a time. I’ve put myself on both a book-buying and fabric-buying “diet”, so I may have to dust off my library card one of these days. I love to read and am a member of a local book club. I had never heard of the Quilting Mysteries so I’m delighted to meet you through your post. The books sound fabulous and will be a must read for me. I will use one as my book choice when its my turn for book club. I just love a good mystery. Congratulations on having a fabulous career! Congratulations on your literary success! Books & quilting definitely go hand in hand, everything I know about quilting I learned from a book! My library branch knows me well….I wore out Marsha McCloskey’s “Block Party” before I was able to purchase my own copy! I used to be an avid reader but then came kids, work and household related chores and time for reading became shorter and shorter. When I finally did find time for myself I always wanted to quilt or crochet which I could do watching movies or deliciously sinful soaps! Still I missed my books. Then, a few years back, my library finally began to stock books on CD. I am so happy to have rediscovered my love of books and instead of reading I am being read to. I listen during my commute, while quilting, crocheting, sometimes even in the tub! Some libraries have even begun offering books on CD that you can download from their site, upload to your MP3 player, some you can burn to CD (I bought a 12 pack of re-writable CDs and use them over and over), or simply listen from your computer. Generally the MP3 will work for a period of 7 days and then stop working once the license expires. Quilts and mysteries sounds like a good combination. I read all the time as a child and visited the library often. One of our daughters loves books and works at a college library; she is always bringing home books. Nancy Drew was my favorite for years. Trouble is if I start reading, I might not even get meals until it is done. Of coarse that happens with quilting and time on the computer, too. I remember my very first trip to the library. I was probably 5 years old and my mother made a really big production out of it. For days she would say to me, “We are going to the library on Saturday and you are going to get a library card!” On that day, I dressed up in my very best Sunday dress and we walked to the town library. The lady behind the counter made a fuss over me, what a big girl I was and now I could read all the books I wanted to read. She showed me around the children’s section, then my mother helped me pick out a few books to take home. That visit became a weekly event. My mother & I would walk to the library every Saturday, rain or shine. In later years, as I got older, many times I would go on my own. After awhile, I started sneaking into other sections, working my way eventually into adult fiction. Books have always been a great love affair. When I started quilting, books on quilting became the 1st teacher. Today, I always am in the middle of a great read and a great quilt. My first “job” was being a library assistant in 7th grade. I loved it. In my “past life” before I got married and moved to the farm, I taught 6th grade for 27 years. I really pushed the books too. I love them. I stumbled upon your first book, read it (quickly as i LOVED it) and passed it along to friends. Same with the second one… now get busy and finish that third one! I am waiting. PS – when I said 3rd I meant the 3rd quilting one. I will have to check out the stamping ones. Love to hear the library stories. We should all thank our local librarian next time we’re in. Being in the middle of a great read and a great quilt is a wonderful place to be, Susan. I love hearing the stories of Lori, Susan, Mary, Shelley, Kathy, Phyllis, Jennifer. Many thanks to those of you who’ve read the books and recommended them to friends. The third one, OCEAN WAVES, comes out in April. 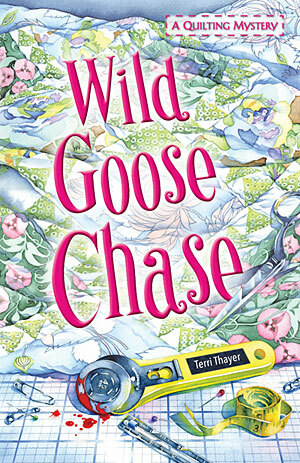 WILD GOOSE CHASE is available on the Kindle, for those of you that are that advanced. I’m an avid library user, too. When I started quilting, the library was my second favorite place (right after my local quilt shop) to learn about quilting, find new patterns, get inspiration, and drool over fantastic quilts. 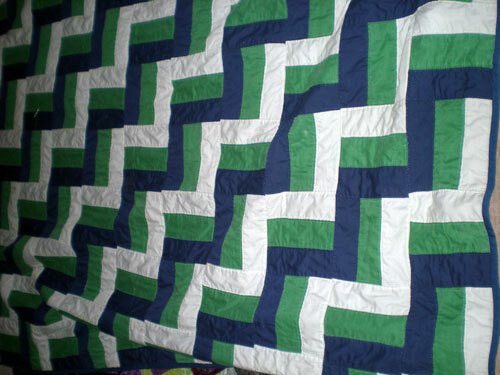 My first quilt was a rail fence, too. Yours looks lots better than mine! But I still have it and still love it. My local library is still a place of inspiration because they have a weekly quilting bee and a knitting and crochet group, too. Shawn, love the idea that instructions can be a mystery. So true. Betty, the good thing about our ugly first quilts is that we have nowhere to go but up! Keep on reading and quilting! I absolutely love libraries. You would think I’d have enough of books/libraries after working all day in a school library. Quilting books whether fiction or nonfiction are my favorite. Enjoyed your quilting mysteries. Looking forward to Ocean Waves. Dang– missed the drawing, but want to read more. You got me hooked. I sew and listen to books on tape. Multi- tasking. I know that when one CD is done, I’ve spent an hour sewing- great way to start the day. An hour a day helps get my projects closer to getting done. Yep – my DH and I are visiting the library often! I love quilting related books (Jennifer Chiavarini, Emilie Richards, Marie Bostwick) and would LOVE to read yours! If I don’t win the give-away, I’ll run to the library and check out your book….but I’d love to win a giveaway just once (LOL). Thanks for all the fabulous comments. I love talking books and writing and see I’m not alone. The winner is: #5, Aida Zayas. Aida, please email me your snail mail address and I’ll put a copy of WGC in the mail.